20-6-2013, more than 1 year old. Don't get me wrong. I'm still crazy about cacti, but it's just that there is not much to write about them anymore. Sure... They're doing all fine and if you look well, you can see that they're becoming bigger, having more spines and stuff like that, but besides posting some photos to show their progress, there's not much to talk about. It was my meaning to create something that doesn't look 'organized'. Just some nice colours together and see what happens. 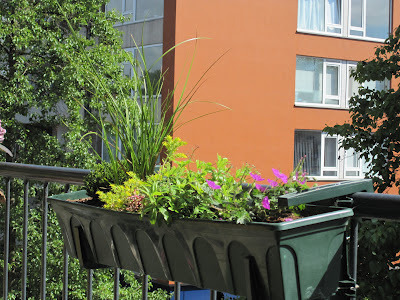 Because of all the plants (there's a lot more), a lot of bumblebees and other insects are invading our balcony at the moment. Time to wake up my very pretty wife and have some breakfast with her. =) Yeah, I can say that I'm a very happy man. I have everything I want right now and we'll see what the future brings.